I know that I am a Born Hunter, but am I Born to Run? I am in current possession of one of the strangest things a chef can ever own…a sun tan. Being an inside at the stove sort of occupation the amount of daylight that a chef normally sees is about the equivalent to a submarine captain. Negligible at best, and when we both do see sun it is on vacation and we get burned. That said I have started this happy go lucky hobby of running at lunch while at work. Sometimes I will even haul around my 50# hunting pack in the blazing sun. Now, since it is like smoking a half pack a day in Boise I have started running in the morning near my house. Each time I go out it is different. The rout, the amount of time I spend running, my speed…all variables are variable. I have even started reading about running (shocking…it is not a book about cooking, philosophy or hunting…honestly I wasn’t even sure what the other sections of the bookstore where for). I am currently tearing through Born to Run by Christopher McDougal. Smile while running seems amazingly simple, but I never thought about it before. I was always thinking a guy should smile when they are DONE running. The dog now licks my face at 6am for a run; her tail loudly smacking wall and disturbing the whole rest of the house. These actions combined have given me, for the first time in 15 years brown freckle spotted shoulders and back. A visible tan line at my boxer shorts. So why this big kick on fitness you might ask? Last hunting season I wounded a buck at about 75 yards with an unfamiliar gun, my Dads neighbors 45/70. Five days later I could see him limping around on a side hill. I had traded to my .243 and was doing my best to catch up with him. The two other bucks he was with split off and left him to hobble up a canyon. I could catch him if I ran fast enough. So I tossed my pack on and booked it down the hill as quick as I could. We caught a sight of each other at about 100 yards. He was broadside on a shale surface, I was standing in the middle of 2 foot high scrub brush. I pulled my gun up on him and the strangest thing happened. The buck was coming and going out of my scope. My chest was heaving and I could not hold a steady aim on the animal. I was so winded from a 400 yard dash for a shot that I could not even make a clean kill. I laid down to shoot him. Too much cover. I tried finding a rest, not a tree in sight. Nothing I could do but steady myself as much as possible and try for a shot. I missed and then missed again. The buck scurried off and I never saw him again. Hopefully he has made a full recovery and I can get him on a later date. But being given the gift of finding the same animal that you previously wounded and then not being able to put it down is humiliating. So shockingly bad that I have suffered a lack of confidence in my shooting skills since. I still don’t feel like I can shoot well enough. I have done two things to help make sure that what happened in 2011 will never happen again. Thing 1 – I bought a shooting stick I shoot off it when I can and am better for it. 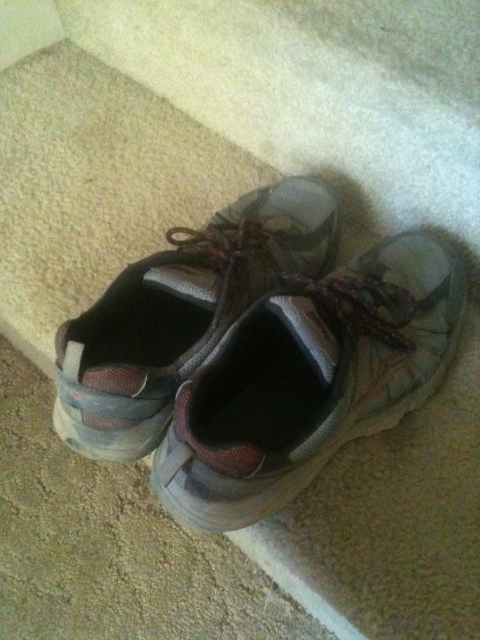 Thing 2 – I now work on my sun tan with running. I can now run 6 miles at a time and have vowed to never have the same issue while hunting again. Being given the gift of three shots on the same animal and simply wounding him will not happen again.